The youth bulge, combined with high levels of unemployment, corruption, inequity, and disaffection with government represent an expanding recruitment pool for a wide range of extremist groups, urban gangs and other destabilizing actors. Yet, if channeled toward productive outlets such as trade schools, entrepreneurship, community leadership and reform campaigns, African youth can be a dynamic force for change. Devising effective means to reach this vital target group must be the focus of security strategies in African for years to come. These were some of the highlights at a recently concluded roundtable on African security hosted by the Africa Center for Strategic Studies at the National Defense University in Washington, D.C. The event was organized in support of the U.S.–Africa Leaders’ Summit with the aim of informing the coverage on peace and security issues and stimulating a discussion on the U.S.–Africa security partnership. Ms. Oluwakemi Okenyodo, the Executive Director of the CLEEN Foundation in Nigeria discussed the dynamics of the youth bulge in relation to political violence, extremism and social exclusion in Nigeria. “The Nigerian youth are nearly seventy five percent of the population, potentially the most innovative and productive and yet the most socially excluded and disgruntled,” Ms. Okenyodo noted. “Nigerian youth, in addition, have extremely high levels of political consciousness and awareness … however, because of the high levels of poverty despite the country’s enormous oil wealth, such awareness becomes a mobilizing tool for violence as has happened in the Niger Delta and other regions in the country,” she cautioned. Ms. Okenyodo urged Nigerian and U.S. officials to pay close attention to these problems and craft appropriate communications and development strategies to reach out to, and engage this demographic of the population. “It is this same demographic that the Nigerian military, police and intelligence as well as Boko Haram are recruiting from … the question then becomes … what is our plan for this segment of Nigeria’s population? We need to think about this very seriously,” she urged. One way forward would be to more closely address the structural weaknesses of the state and in particular to craft institutional and policy reforms to make it more inclusive, less corrupt, more accountable and more effective at delivering public goods such as education, health, economic opportunities, and social safety nets. Such interventions could pay huge dividends by rebuilding the social contract and reestablishing trust between citizens and the public sector. This would require a shift in policy thinking. “Security sector reform programs should be conceived in the context of broader governance issues and not implemented in isolation,” the expert suggested. 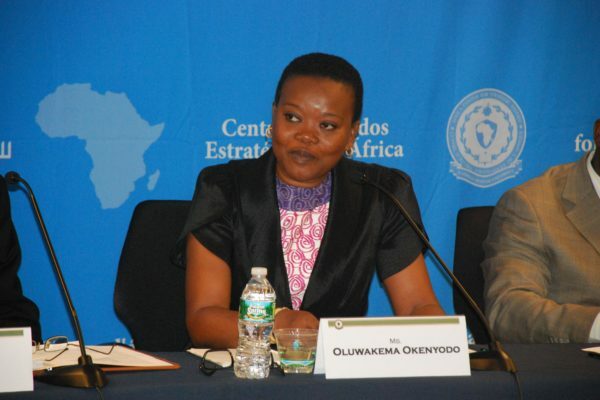 Ms. Okenyodo also pointed out some more positive developments taking place in her country. She also highlighted the security partnership between the United States and Nigeria. The session provoked lively debate. Niger’s Ambassador to the United States, Dr. Maman S. Sidikou, who has recently appointed as the new African Union (AU) Special Representative for Somalia (SRCC) and Head of the AU Mission in Somalia (AMISOM) emphasized the importance of partnership. “Tackling corruption within the political system as a whole plays a vital role in addressing perceptions of exclusion among the youth and indirectly undermining the potency of extremist groups that capitalize on social and political discontent. … This cannot be done if democracy, development and governance are approached separately.